Here is a new thread to discuss about the next Super GT season. 100 Team Kunimitsu used number 1 for the next season . For GT300 champion, this is the first time for LEON RACING used number 0 car for AMG GT3. As the calendar for the SUPER GT is slightly changed by swapping the order with Autopolis round with Sugo round and vice versa. But it doesn't look too bad for me. 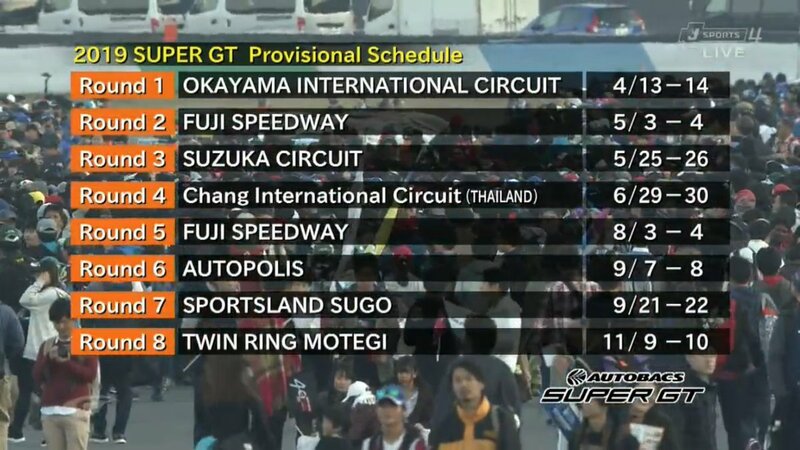 And here is the timetable for the 2019 season of SUPER GT. Both Kazuki Nakajima and Kamui are not available in the Lexus camp because they facing two clashes with WEC events which is 6 hours of Spa and 4 Hours of Shanghai. Rossiter will return as full time driver in the next season. Are there any news overall or rumors about Toyota coming back with new supra into gt500? I doubt it. The LC serves GT500 just fine. If anything I wonder if there will be a Supra GT300. And it seems the Prius will stay, just not in MR form. That according to Sam Collins per the NISMO live feed. This is a series that needs class color coding big time. I do have trouble telling the difference between GT500 and GT300 during those periods when there is heavy traffic. Do what IMSA does. Red number plates and mirrors for GT500 and green for GT300. Maybe the classes should have different names too? I like it the way it is. I can tell the difference pretty easily. But maybe that's because I watch every race and know every GT500 cars' livery? The colour difference is there. White number background and windscreen stripe for the GT500 and yellow for GT300. It is just not THAT different from each other. There is a pretty distinct difference between GT500 and GT300. 500 has the distinct DTM-style fender flares, 300 don't - they have their own unique fender flarings depending on the vehicle type, but none resemble the DTM look. The latest information available is that apr will build a new Prius GT, this one with a front-engined layout, and the supercapacitor hybrid still partnered to a V8 engine, but now it would be a 5.4 litre V8 sourced from the Lexus RC F GT3. There's enough difference between the two classes to tell them apart. Furthermore, there are just three models competing in GT500, and you can tell them pretty easily even when they are next to their GT300 counterparts. well if you notice GT500 have a white lights and GT300 have a yellow light too. will Nakajima continue to persist with Dunlop, they seldom produce any good results, is it just a financial issue? once upon a time they were the fastest of the Honda teams. Curious about this. How long ago are we talking about? I recall that nsx "epson" from gran turismo 5 (released in late 2010) was 2007 or 2008 specs and had dunlop stickers, guess nakajima team has a dunlop relationship lasting more than 10 years. To me is dunlop the one that pays the team.... can't believe nakajima can't afford bridgestone bills. Guess kondo racing - yokohama is the same. Nakajima Racing has been supplied by Dunlop since 2005 season, they have best result at 2007 (when NSX dominated GT500 class), finished 2nd at standings but things went down afterwards.